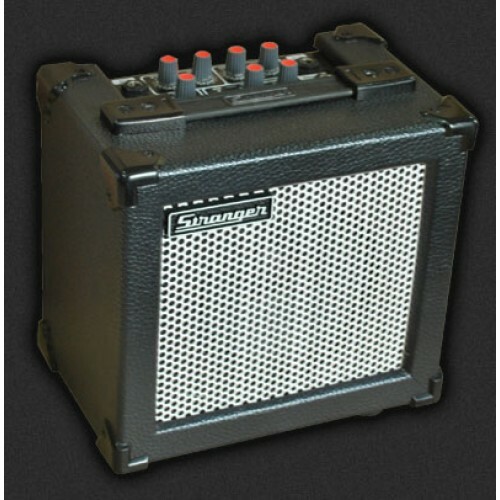 Stranger C6 mini amplifer, available in taalmusicals, vijayawada, vishakahapatnam, mumbai, pune, bangalore, hyderabad. 6 Watts RMS output with 5” Speaker. Effects: Digital Echo & Overdrive. 2 Way Tone Control Bass & Treble. 3 Input 2 Channels. (Guitar/AUX/MP3 & Mic.). MP3 Player with USB & MMC Card Slot & Remote. Compact Size, Plywood Rexine Finish. Power Supply: AC 220V 50 Hz / AA x 8 Battery. Dimension: 210 (W) x 155 (D) x 210 (H) mm.